Ah, institutional racism, the gift that keeps on giving. 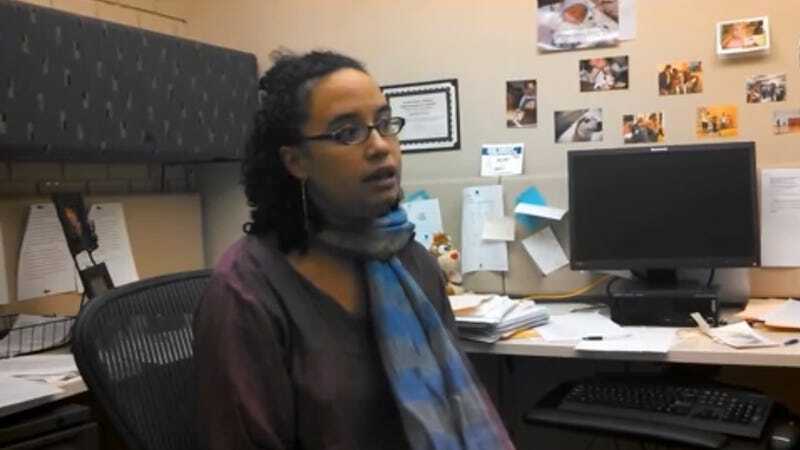 In a twist of irony served with a shake of my damn head, a black professor at Minneapolis Community and Technical College was handed a formal reprimand after she attempted to explain to two white students the pervasiveness of structural racism. Shannon Gibney, a faculty member was leading a discussion in her Intro to Mass Communication class, when she was interrupted by a white male student who was over having to talk about race in 2013. He was joined by another student who added, "It's like people are trying to say that white men are always the villains, the bad guys. Why do we have to say this?" Gibney tried to explain to them that she was not referring to them personally or any other white person specifically when she was talking about whiteness as system of oppression, a reality in our culture, to no avail. When it became clear her clarification was not being well-received, she hilariously quipped, "If you're really upset, feel free to go down to legal affairs and file a racial harassment discrimination complaint." While I believe it was your intention to discuss structural racism generally…it was inappropriate for you to single out white male students in class. Your actions in [targeting] select students based on their race and gender caused them embarrassment and created a hostile learning environment." Sadly, this is not the first time that Gibney has faced this type of treatment from both students and administration. Time and time again, she and innumerable others have run into the same issue of navigating the impossible labyrinth between personal and systematic experiences of oppression, whether as subject or alleged enforcer. Calling out hegemony far too easily becomes spreading hatred, and the same marginalizing system continues to be reinforced, whether by law or by a note from the VP of Academic Affairs. Gibney and six other professors plan to file an anti-discrimination lawsuit against the school, a move that will hopefully work to restore their voice and authority as faculty members.